Mr Mange Ram, Director, KVIC, Himachal Pradesh revealed that it was decided to hold such awareness programme in bee keeping across the State to assess the potential of improved honey bee production that would further address food security and poverty challenges at household level within some selected villages in the State. He further stated that so the commission had held six such camps and it has proposed to awareness camps in district Chamba during this month. He also revealed that state has been given a target of 300 villagers to bring to bee keeping activity. So far 90 villagers have shown their interest in bee keeping, he said and added that the target would be achieved by the end of this year. The KVIC would provide 10 boxes of to each who wanted to start bee keeping. The government would provide 80 per cent subsidy. Each box cost around Rs 3,700. The commission would impart necessary training free of cost to the aspirants of bee keeping. The district industry centres and Punjab National Bank, would provide micro-financial services. KVIC during the year 2016-17 has trained 8437 persons in bee keeping in 20 States with a financial outlay of Rs 1.27 crore, said Mr Singh and added one can do this activity without disturbing other agricultural activity. Mr Balbir Singh, Adviser, RCED, Chandigarh while speaking on the occasion said that self-employment can be the only answer to come over poverty challenges among the farmers and unemployment among the youth. Adoption of bee keeping can improve their livelihood and contribute in enhancing sustainable conservation of environment, he says and added that presence of honey bee in the area could be useful to enhance food security. He also spoke at length about the importance of value-add in honey. While the plain honey could be sold between Rs 400 to Rs 500 per kg but with the addition of values one kilogram honey can be sold at Rs 1400, he said. 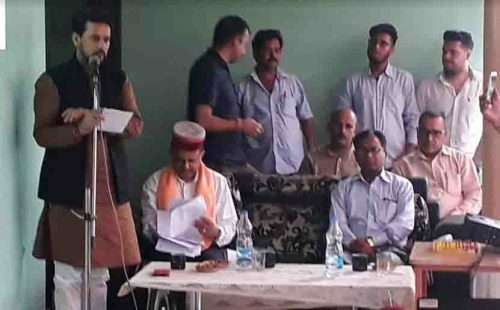 Mr Anurag Thakur, Member Parliament, Hamirpur also attended the awareness camp said that beekeeping was one of the best practices that villagers could adopt without much investment and earn maximum income. He hoped that training and encouragement of villagers would lead to greater success in bee keeping in the State and which in turn contributed in alleviation of poverty among ruralites. He said state government was in the back of the people and people of the state should avail the benefits of various schemes.